Description: The Cubanola is a small, tropical tree native to the Dominican Republic, Cuba and other parts of the Caribbean. It grows 5-8’ tall in full sun or shade. In our conservatory, the white, trumpet-shaped blooms cover this tree a couple times a year for over a month. The blooms are fragrant at night and in the morning. 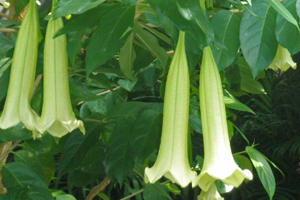 The flowers resemble those of the Angel’s Trumpet (Solanaceae family), but Cubanola is actually in the same family as coffee or gardenias (Rubiaceae). While the flowers reportedly attract butterflies, we have not found this to be the case in our conservatory. Guests and staff of the Butterfly House, however, are attracted to the sight of this tree in full bloom as it is now.